The Vancouver Canucks named their four alternate captains prior to opening night, and no one was terribly surprised about the outcome. Everyone expects that Bo Horvat will be the future captain of this team, so handing him the ‘A’ was a no-brainer. The Canucks also decided to name Brandon Sutter, Alex Edler and Chris Tanev alternate captains as well. Going the veteran route was safe, but this organization missed an opportunity to anoint one of its other young players as a leader. I’m not talking about Calder Trophy candidate Brock Boeser, but his University of North Dakota teammate, Troy Stecher. I’ll start by saying I have no quarrels to pick about the Canucks not naming Horvat captain. While some do have a problem with that decision, there’s no need for this team to rush and anoint a long-term leader. Even though some players have been named captain as teenagers, 23 years old is still young to captain an NHL squad. It’s certainly not too young to have an ‘A’ on your chest, and the Canucks could have done right by naming Stecher as an alternate captain. One of the reasons why the Sedins were so unanimously respected by their teammates was because of their accountability with the media. Even after losses, the Sedins always trotted out and answered every single question the media threw their way. One guy who is already accountable with the media is Stecher. He’s widely considered one of the most approachable guys in the dressing room by media, and his razor-sharp memory allows him to provide interesting player analysis. On the flipside, Edler and Tanev might be the two quietest guys on the team. Maybe having just one of those guys as an alternate would have been a better idea? Stecher is also one of the easiest players to root for on the Canucks. The undersized defenceman earned his way onto the team through hard work and a high hockey IQ. 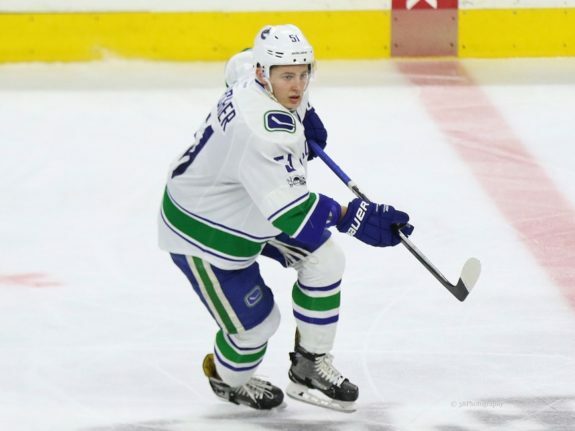 As a player who hails from the Vancouver suburb of Richmond, B.C., he gives a younger generation of Canucks fans hope that both undersized and local players can earn a shot playing pro hockey through hard work. Even though Stecher wasn’t named an alternate captain, the possibility of him donning an ‘A’ remains a real option in a few years time. 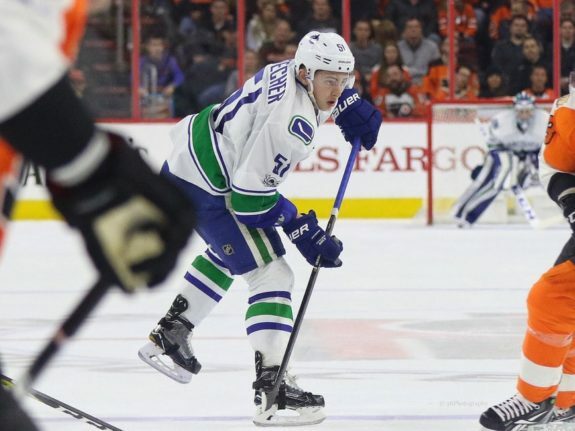 While some of the younger Canucks have had their ups and downs, Stecher has constantly improved his game. It took Stecher some time to earn the trust of head coach Travis Green, but the bench boss did increase his ice time throughout last season. Even though he dropped from 24 points in 2016-17 to just 11 last season, his ability to defend made him one of the most effective Canucks. It’s hard to know exactly how players are viewed in the room, but from an outsider’s perspective, you can see Stecher’s leadership qualities. He’s not shy about being in the public eye in Vancouver, attending events such as the Raise-A-Reader campaign in Vancouver. Stecher further supplanted his roots in the community by becoming co-owner of Junior B hockey’s White Rock Whalers. Personnel on this team will continue changing over the next few years. That includes players like the three who were just named alternates. Edler’s contract expires at the end of the season, Tanev’s name constantly surfaces in trade talks, and some wonder about where Sutter fits with this team long-term. One guy who does appear to be around for the long-term is Stecher. If that holds true, expect to see a letter on his jersey in the near future.